The practitioner’s objective in treating flexible flatfoot is to realign the foot and eliminate pain. Multiple nonsurgical therapeutic options are available, but if those are unsuccessful, surgical interventions can be effective. Flexible pes planovalgus (flatfoot) is a common condition that should be treated when it is associated with pain.1 A flatfoot in its simplest terms is defined as collapsing of the foot, resulting in loss of arch height. Flexible flatfoot differs from rigid flatfoot in that a rigid flatfoot is permanently fixed in the flat position. A flexible flatfoot is only made flat when weight is put onto the foot during standing or walking. It is important to differentiate the two forms of flatfoot (flexible vs rigid) because the management of the conditions is markedly different. Flexible flatfoot, in general, is considered to be a less severe condition. However, flexible flatfoot can be a very serious problem. The focus of this article is to identify the key features of flexible flatfoot, describe conservative treatment options, and highlight the common surgical procedures that are used to correct a flexible flatfoot. Figure 1. An End-Stage Flatfoot may result in collapse and arthritis of the foot and ankle. The malalignment of the rearfoot (blue line) and forefoot (yellow line) is evident in this case. The ankle in this patient is subluxed and arthritic secondary to the longterm effects of a flexible flatfoot. A very common cause of adult flatfoot is posterior tibial tendon dysfunction. It is well known that the posterior tibial tendon complex is the main muscular supporter of the arch. The posterior tibial tendon originates on the posterior aspect of the tibia and fibula and courses around the inner ankle to insert primarily on the navicular tuberosity, with extensions throughout the arch. The role of this tendon is to lift the arch. In some cases, posterior tibial tendon problems develop over time as a result of a flatfoot. Conversely, in other cases, injury or disease (secondary to systemic conditions) to the posterior tibial tendon may produce a flatfoot. It is critical to understand that the flatfoot itself is never truly the source of pain. It is the secondary effects of the malpositioned foot that result in a pain cascade. Some patients may complain of pain directly under the arch where the bones have collapsed. Painful calluses may develop on the bottom of the foot in areas of increased pressure, and a common site is under the navicular tuberosity. Often, the foot will abut the ankle and cause inflammation on the outer foot within the sinus tarsi. Heel pain may develop and present as plantar fasciitis. Strain on the posterior tibial tendon may result in pain at its tendinous insertion, as well as overt tendinitis with warmth and inflammation. Bunions may occur concomitantly with flexible flatfoot and seem to be associated with ligamentous laxity and hypermobility of the medial column of the foot. While the term “flatfoot’ is synonymous with flattening of the arch, it is really an incorrect term for describing the actual pathology of the condition. There are three components of a flatfoot: collapse of the arch, heel valgus, and forefoot abduction. Some cases will exhibit all three components of the flatfoot equally, while other cases may exhibit features of only one component – because each component occurs in a single plane, this is referred to as planal dominance of the flatfoot. The flattening of the arch is the easiest component to recognize, which is probably why the term ‘flatfoot’ is so often used to describe the condition. Heel valgus is identified when evaluating a patient from behind. Forefoot abduction is also seen best from behind, as patients may appear as if they have too many toes. 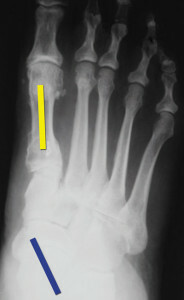 Radiographs are necessary in the evaluation of the painful flatfoot.5 Obviously most rigid causes of flatfoot (e.g., tarsal coalitions) may be immediately identified with simple radiographs, and are easily distinguished from flexible flatfoot.6,7 It is necessary to obtain standing (weightbearing) x-rays when evaluating a flatfoot because there are many joints in the foot that may be responsible for the collapse and subluxation. Flexible flatfoot requires a keen eye to evaluate the position of each bony segment and the relationship of the forefoot to rearfoot, as well as the position of the foot relative to the ankle and leg. Also, arthritic joints need to be identified, as the presence of arthrosis often will dictate the surgical plan. Magnetic resonance imaging is useful when flatfoot is secondary to posterior tibial tendinopathy, as tears of this tendon may be identified. Figure 2. In this case, a skeletally immature child with a flexible flatfoot was treated with a subtalar joint arthroereisis and open Tendo Achilles lengthening. The metallic implant prevents the rearfoot from collapsing. The preoperative and postoperative radiographs demonstrate improvement of the alignment of the rearfoot (blue line) and forefoot (yellow line). There is a stepwise approach to conservatively managing a flexible flatfoot; some aspects are patient-driven and other aspects are practitioner-driven. Several treatment modalities are used simultaneously to achieve a clinical improvement, and it is not always clear which particular modality results in the largest therapeutic benefit. Understanding the available conservative management options will better allow the practitioner to manage patient exceptions should they begin to fail certain treatments, and to initiate the next appropriate level of treatment. Education. Education is crucial when managing flatfoot. The better a patient understands the condition, the more proactive they may be to treating it. Adults with flatfoot have often lived with the condition and may have slowly noticed the foot collapse over a period of years, which may help them understand the importance of intervention, especially if pain develops. Children and adolescents, on the other hand, may be less resistant to intervention because they may not have any discomfort and only be seeking intervention because their parents are concerned about the flattening foot. It must be remembered that the presence of a flatfoot doesn’t necessarily indicate a pathologic process, and practitioners should illustrate this to their patients as treatment recommendations are made. Stretching. Because a tight calf muscle (equinus – contracture of the gastrocnemius and/or soleus) has been long associated with flexible flatfoot, a stretching program is a simple intervention aimed at counteracting this foot-deforming force. Most stretching efforts are centered on stretching the more superficial calf muscle, the gastrocnemius. Non-steroidal anti-inflammatory drugs (NSAIDs). When inflammation is associated with a painful flexible flatfoot, oral NSAIDs may be used as they are known to reduce inflammation. In particular, they should be used to manage acute episodes of inflammation. It is important to recognize that NSAIDs are not a stand-alone treatment option for flexible flatfoot and should be combined with other treatment modalities. Figure 3. Intraoperative photo demonstrating enlarged hypertrophic degenerated posterior tibial tendon. The flexor digitorum longus tendon is accessed through the same incision, and is harvested for transfer to the posterior tibial tendon. Shoe gear selection. It is important to educate patients on proper shoe selection for their foot condition. Because flexible flatfoot by definition is ‘flexible’, a stable shoe is necessary to support the foot during walking. In my experience, an unstable (flexible) shoe will only promote further degeneration and pain. Key features that a shoe should have include a stiff sole and a firm heel counter.8 A shoe should not easily twist when manually torqued. A shoe should mainly bend at the ball of the foot and not at the midsole; I find this aspect to be the most critical component of a shoe when considering flatfoot deformity because a shoe that is flexible at the arch puts more stress on the arch of the foot. Lastly, a shoe should have a removable insole to accommodate a more stable orthotic than is typically provided by shoe manufacturers. Orthotics. Insoles placed inside the shoe are important conservative interventions that work by providing structural support to the flexible flatfoot.8-10 Over the counter arch supports may be tried. Custom insoles prescribed by a physician may better balance the foot. There are specific modifications that can be added to the insole to address the collapse of the arch (such as medial flanges) and eversion of the heel (such as heel posts and skives). Spot cushioning is also very useful for areas of excessive pressure related to a flatfoot. In children, although orthotic treatment of asymptomatic flexible mild flatfoot is controversial,3 it is common to prescribe a more supportive insole when confronted with a moderate to severe flatfoot.10 The UCBL insert, for lack of a better term, ‘cups’ the heel and arch in a neutral position. It is made from an impression of the foot and in essence becomes a replica of the foot in the corrected position. A major benefit of the UBCL is that it also fits inside a tennis shoe. Ankle foot orthoses (AFOs). These braces are used for more serious/severe cases of flatfoot and/or less mild forms of flatfoot that have not responded to treatment with insoles.11,12 An AFO is a device that supports the arch and extends upward on the ankle and lower leg to provide additional support for the foot.13 These are also fabricated from a mold of the foot and ankle. More contemporary braces combine the benefits of a custom insole with those of an AFO, which is especially useful for patients suffering from chronic posterior tibial tendon dysfunction. Figure 4. The Lapidus bunionectomy is a midfoot fusion procedure that stabilizes the arch. The preoperative and postoperative radiographs demonstrate improvement of the alignment of the rearfoot (blue line) and forefoot (yellow line). Casting and immobilization. This is a last conservative treatment option for managing patients with symptomatic flexible flatfoot, and is typically most commonly indicated for patients with posterior tibial tendinitis. However, treatment of acute cases of posterior tibial tendinitis (or tendinopathy) may begin with immobilization, followed by other conservative measures such as those listed above once inflammation is resolved. Nonetheless, the purpose of casting is to remove the strain placed on the posterior tibial tendon. Ideally a short-leg nonweightbearing cast provides the most ‘rest’ to the tendon. Some patients are better managed in a walking cast and this depends on the severity of the tendinitis. An alternative is a removable CAM (controlled ankle motion) walker, which may be beneficial if concomitant physical therapy is being used. Surgery for flexible flatfoot is geared to towards patients who have failed conservative treatment.1 The purpose of any surgical intervention is to improve the overall foot alignment and reduce or eliminate pain. 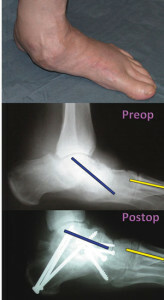 A variety of surgical techniques and procedures are used to reconstruct a flatfoot, including tendon lengthening, tendon augmentation, bone supporting implants (arthroereisis device), bone cuts (osteotomies), and/or bone fusions. Figure 5. This patient underwent a flatfoot reconstruction for flexible flatfoot. The surgical procedure performed is a midfoot fusion involving the first three tarsometatarsal joints, a medializing calcaneal osteotomy, and a gastrocnemius intramuscular aponeurotic recession. The preoperative and postoperative radiographs demonstrate improvement of the alignment of the rearfoot (blue line) and forefoot (yellow line). Gastrocnemius recession or tendon Achilles lengthening. Surgical management of equinus is often performed with flatfoot correction surgeries.14-16 This may be performed with a gastrconemius recession or tendo Achilles lengthening, and is determined by the clinical exam.14-16 Various techniques for gastrocnemius recession exist.3,17-19 A contemporary approach involves lengthening only the muscular bound gastrocnemius aponeurosis (Gastrocnemius Intramuscular Aponeurotic Recession, or GIAR); this technique, theoretically, only weakens the gastrocnemius pull while preserving the natural anatomic insertional attachment of gastrocnemius on the soleus.19 A tendo Achilles lengthening may be performed percutaneously or open. The advantage of an open procedure is that surgeons can determine the exact amount of lengthening and adequately secure the tendon to prevent postoperative overlengthening, which can occur from patient noncompliance. Figure 6. A severe case of flatfoot associated with degeneration and subluxation of the subtalar and talonavicular joints. Clinically one can see the sagittal plane collapse of this foot with a prominent talonavicular head. A triple arthrodesis is necessary to correct the rearfoot collapse in this case. The preoperative and postoperative radiographs demonstrate improvement of the alignment of the rearfoot (blue line) and forefoot (yellow line). Arthroereisis implants. Arthroereisis type procedures are popular in younger patients. (Figure 2) The procedure calls for placing an implant (metallic or absorbable) into the rearfoot between the talus and calcaneus.20-23 This implant acts as a spacer that prevents and/or limits excessive pronation or collapse of the arch. Although implanting an arthroereisis device is indeed a surgical procedure, it is probably the least invasive flatfoot procedure because it does not involve the cutting of bone or tendon work. There is also a perception that the procedure is somewhat reversible, if the implant needs to be removed at a later date. As such, the procedure is popular for use in children and adolescents. It has been theorized that arthroereisis may provide support to a growing foot that will help normalize the bony anatomy with maturation.24–26 Additionally, arthroeresis procedures may be used in combination with various procedures listed below, primarily posterior tibial tendon augmentation and midfoot fusions. In these cases, the arthroesis aligns the rearfoot while other procedures align other parts of the foot. Medializing calcaneal osteotomy. The medial calcaneal osteotomy is a staple procedure for flexible flatfoot reconstruction, and is indicated when the heel is in a valgus position.34–37 A bone cut is performed on the widest portion of the calcaneus, and then the posterior aspect of the heel is repositioned under the leg and fixated with screws. The procedure may be performed in adolescents who are skeletally immature, but in such cases the fixation is performed with pins rather than screws to avoid growth disturbances of the bone. In my experience, heel valgus greater than 8° to 10° may be better addressed with rearfoot fusions, but this is a clinical decision. Rearfoot fusions. Rearfoot fusion type procedures are reserved for severe cases of flexible flatfoot deformity, as a salvage procedure when other methods of reconstruction have failed, or with arthrosis and collapse of the rearfoot. 1 In general, rearfoot fusions should be avoided in younger patients as the rearfoot fusion procedures involve essential joints of the foot, and loss of these joints may result in premature degeneration in surrounding joints, such as the ankle or midfoot. Even so, rearfoot fusions may be necessary to stabilize the foot. A rearfoot fusion may involve a subtalar joint arthrodesis, talonavicular joint arthrodesis, and/or a calcaneocuboid joint arthrodesis. Fusion of all three rearfoot joints is called a triple arthrodesis. Symptomatic flexible flatfoot is a complex condition. Various non-surgical modalities can be used to structurally realign the foot. Surgical intervention is warranted when conservative treatment has failed. The objective of any treatment is to realign the foot and eliminate pain. Every case of flexible flatfoot must be considered on an individual basis when developing a surgical plan. Neal M. Blitz, DPM, FACFAS, is chief of foot surgery in the department of orthopaedics at Bronx-Lebanon Hospital Center in the Bronx, NY. Pawel Hanulewicz, MD, is a clinical research fellow within the same department. 1. Blitz NM, Stabile RJ, Giorgini RJ, DiDomenico LA. Flexible pediatric and adolescent pes planovalgus: conservative and surgical treatment options. Clin Podiatr Med Surg 2010;27(1):59-77. 2. Harris EJ. The natural history and pathophysiology of flexible flatfoot. Clin Podiatr Med Surg 2010;27(1):1-23. 3. Evans AM. The flat-footed child – to treat or not to treat: what is the clinician to do? J Am Podiatr Med Assoc 2008;98(5):386-393. 4. Gourdine-Shaw MC, Lamm BM, Herzenberg JE, Bhave A. Equinus deformity in the pediatric patient: causes, evaluation, and management. Clin Podiatr Med Surg 2010;27(1):25-42. 5. Cicchinelli LD, Pascual Huerta J, García Carmona FJ, et al. Analysis of gastrocnemius recession and medial column procedures as adjuncts in arthroereisis for the correction of pediatric pes planovalgus: a radiographic retrospective study. J Foot Ankle Surg 2008;47(5):385-391. 6. Rodriguez N, Volpe RG. Clinical diagnosis and assessment of the pediatric pes planovalgus deformity. Clin Podiatr Med Surg 2010;27(1):43-58. 7. Rodriguez N, Choung DJ, Dobbs MB. Rigid pediatric pes planovalgus: conservative and surgical treatment options. Clin Podiatr Med Surg 2010;27(1):79-92. 8. Kirby KA. The medial heel skive technique. Improving pronation control in foot orthoses. J Am Podiatr Med Assoc 1992; 82(4):177-188. 9 . Valmassy RL. Torsional and frontal plane conditions of the lower extremity. In: Thomson P, Volpe R, eds. Introduction to podopediatrics. 2nd ed. New York: Churchill Livingstone;2001:231-255. 10. Jay RM, Schoenhaus HD, Seymour C, et al. The Dynamic Stabilizing Innersole System (DSIS): the management of hyperpronation in children. J Foot Ankle Surg 1995;34(2):124-131. 11. Imhauser CW, Abidi NA, Frankel DZ, et al. Biomechanical evaluation of the efficacy of external stabilizers in the conservative treatment of acquired flatfoot deformity. Foot Ankle Int 2002;23(8):727-737. 12. Marzano R. Functional bracing of the adult acquired flatfoot. Clin Podiatr Med Surg 2007;24(4):645-656. 13. Logue JD. Advances in orthotics and bracing. Foot Ankle Clin 2007;12(2):215-232. 14. Lamm BM, Paley D, Herzenberg JE. Gastrocnemius soleus recession: a simpler,more limited approach. J Am Podiatr Med Assoc 2005;95(1):18-25. 15. Strayer LM Jr. Gastrocnemius recession; five-year report of cases. J Bone Joint Surg [Am] 1958;40(5):1019-1030. 16. Strayer LM Jr. Recession of the gastrocnemius; an operation to relieve spastic contracture of the calf muscles. J Bone Joint Surg [Am] 1950;32(3):671-676. 17. Blitz NM, Eliot DJ. Anatomical aspects of the gastrocnemius aponeurosis and its insertion: a cadaveric study. J Foot Ankle Surg 2007;46(2):101-108. 18. Blitz NM, Eliot DJ. Anatomical aspects of the gastrocnemius aponeurosis and its muscular bound portion: a cadaveric study-part II. J Foot Ankle Surg 2008; 47(6):533-40. 19. Blitz NM, Rush SM. The gastrocnemius intramuscular aponeurotic recession: a simplified method of gastrocnemius recession. J Foot Ankle Surg 2007; 46(2):133-138. 20. Harris EJ, Vanore JV, Thomas JL. Diagnosis and treatment of pediatric flatfoot. J Foot Ankle Surg 2004;43(6):341-373. 21. Chambers E. An operation for the correction of flexible flatfoot of adolescents. West J Surg Obstet Gynecol 1946;54:77-86. 22. Baker LD, Hill LM. Foot alignment in the cerebral palsy patient. J Bone Joint Surg [Am] 1964;46:1-15. 23. Selakovich WG. Medial arch support by operation. Sustentaculum tali procedure. Orthop Clin North Am 1973;4(1):117-144. 24. Giannini BS, Ceccarelli F, Benedetti MG, et al. Surgical treatment of flexible flatfoot in children, a four-year follow-up study. J Bone Joint Surg [Am] 2001;83(Suppl 2, Pt 2):73-79. 25. Saxena A, Nguyen A. Preliminary radiographic findings and sizing implications on patients undergoing bioabsorbable subtalar arthroereisis. J Foot Ankle Surg 2007;46(3):175-180. 26. Needleman RL. A surgical approach for flexible flatfeet in adults including a subtalar arthroereisis with the MBA sinus tarsi implant. Foot Ankle Int 2006; 27(1):9-18. 27. Kidner FC. The pre hallux (accessory scaphoid) in its relationship to flat foot. J Bone Joint Surg 1929;11(4):831-837. 28. Sullivan JA, Miller WA. The relationship of the accessory navicular to the development of the flat foot. Clin Orthop Relat Res 1979;(144):233-237. 29. Chiu NT, Jou IM, Lee BF, et al. Symptomatic and asymptomatic accessory navicular bones: findings of Tc-99m MDP bone scintigraphy. Clin Radiol 2000; 55(5):353-355. 30. Bennett GL, Weiner DS, Leighley B. Surgical treatment of symptomatic accessory tarsal navicular. J Pediatr Orthop 1990;10(4):445-449. 31. Kopp FJ, Marcus RE. Clinical outcome of surgical treatment of the symptomatic accessory navicular. Foot Ankle Int 2004;25(1):27-30. 32. Tan SM, Chin TW, Mitra AK, et al. Surgical treatment of symptomatic accessory navicular. Ann Acad Med Singapore 1995; 24(3):379-381. 33. Prichasuk S, Sinphurmsukskul O. Kidner procedure for symptomatic accessory navicular and its relation to pes planus. Foot Ankle Int 1995;16(8):500-503. 34. Mosier-LaClair S, Pomeroy G, Manoli A 2nd. Operative treatment of the difficult stage 2 adult acquired flatfoot deformity. Foot Ankle Clin 2001;6(1):95-119. 35. Weinfeld SB. Medial slide calcaneal osteotomy. Technique, patient selection,and results. Foot Ankle Clin 2001;6(1):89-94. 36. Nyska M, Parks BG, Chu IT, et al. The contribution of the medial calcaneal osteotomy to the correction of flatfoot deformities. Foot Ankle Int 2001;22(4):278-282. 37. Catanzariti AR, Mendicino RW, King GL, et al. Double calcaneal osteotomy: realignment considerations in eight patients. J Am Podiatr Med Assoc 2005; 95(1):53-59. 38. Evans D. Calcaneo-valgus deformity. J Bone Joint Surg [Br] 1975;57(3):270-278. 39. Raines RA Jr, Brage ME. Evans osteotomy in the adult foot: an anatomic study of structures at risk. Foot Ankle 1998;19(11):743-747. 40. Mosca V. Calcaneal lengthening for valgus deformity of the hindfoot. J Bone Joint Surg [Am] 1995;77(4):500-512. 41. Cooper PS, Nowak MD, Shaer J. Calcaneocuboid joint pressures with lateral column lengthening (Evans) procedure. Foot Ankle Int 1997;18(4):199-205. 42. DiNucci K, Christensen JC. Calcaneocuboid joint contact with Evans calcaneal osteotomy. Presented at annual meeting of American College of Foot and Ankle Surgeons, San Francisco, March 1995. 43. DiNucci KR, Christensen JC, Dinucci KA. Biomechanical consequences of lateral column lengthening of the calcaneus: Part I. Long plantar ligament strain. J Foot Ankle Surg 2004;43(1):10-15. 44. Tien TR, Parks BG, Guyton GP. Plantar pressures in the forefoot after lateral column lengthening: a cadaver study comparing the Evans osteotomy and calcaneocuboid fusion. Foot Ankle Int 2005;26(7):520-525. 45. Martin DE. Callus distraction: Principles and Indications. In: Banks AS, Downey MS, Martin DE, Miller SJ, editors. McGlamry’s Comprehensive Textbook of Foot and Ankle Surgery, 3rd edition, vol 2. Philadelphia: Lippincott Williams and Wilkins; 2001. p. 2097-2117. 46. Davitt JS, MacWilliams BA, Armstrong PF. Plantar pressure and radiographic changes after distal calcaneal lengthening in children and adolescents. J Pediatr Orthop 2001;21(1):70-75. 47. Moseir-LaClair S, Pomeroy G, Manoli A 2nd. Intermediate follow-up on the double osteotomy and tendon transfer procedure for stage II posterior tibial tendon insufficiency. Foot Ankle Int 2001;22(4):283-291. 48. Cotton FJ. Foot statics and surgery. N Engl J Med 1936;214:353-362. 49. Helal B. Surgery for adolescent hallux valgus. Clin Orthop Relat Res 1981;(157):50-63. 50. Kelikain H. Hallux valgus, allied deformities of the forefoot and metatarsalgia. Philadelphia: WB Saunders; 1965. 51. Young JD. A new operation for adolescent hallux valgus. Univ Pa Med Bull 1910;23:459. 52. Lapidus PW. The operative correction of the metatarsus varus primus in hallux valgus. Surg Gynecol Obstet 1934;58:183-191. 53. Hoke M. An operation for the correction of extremely relaxed flatfeet. J Bone Joint Surg 1931;13(4):773-783. 54. Miller OL. A plastic flatfoot operation. J Bone Joint Surg 1927;9(1):84-91. 55. Dockery GL. Symptomatic juvenile flatfoot condition: surgical treatment. J Foot Ankle Surg 1995;34(2):135-145. 56. Blitz NM, Lee T, Williams K, et al. Early weight bearing after modified Lapidus arthodesis: a multicenter review of 80 cases. J Foot Ankle Surg 2010;49(4):357-362. 57. Hansen ST. Functional reconstruction of the foot and ankle. Philadelphia: Lippincott Williams & Wilkins; 2000. There are other conservative approaches not mentioned that work extremely well for flat feet. First of all the posterior tibia malfunction is frequently caused from two main sources; 1. The low back subluxation at L-5 which is the primary nerve to this muscle (posterior tibia). 2. The inhibition of mechanoreceptors to adjacent muscular activity created by the malalignment of any one of the nine bones the posterior tibia inserts into on the bottom of the foot.